Weekend checklist consisted of: getting too much sun on our uncharacteristically warm Saturday and chopping off a few inches of hair. This look is GREAT on you & I LOVE the shorter hair!!! super cute casual outfit! i've been obsessed with pink shorts since they walked down isabel marant's runway. I absolutely love your hot pink shorts! Love your new do and your outfit! So fun for a beautiful spring day. Thanks for sharing! You rock the short do so well!!! your hair looks awesome! love it this length :-) and love those shorts..the color is perfect! Gorgeous hair!!! Love that you are brave enough to keep going shorter!! love those shorts! I wish i was daring enough to wear my hair short. It looks great on you! and you have to have great legs to wear those...ladies the giveaway on my blog right now promises those!! Amazing blog! So happy to have found it, your photos are inspiring! Love seeing you in a casual outfit! Those shorts are too cute! LOVE these amazing neon shorts! Adorable and effortless. Love your shorts! 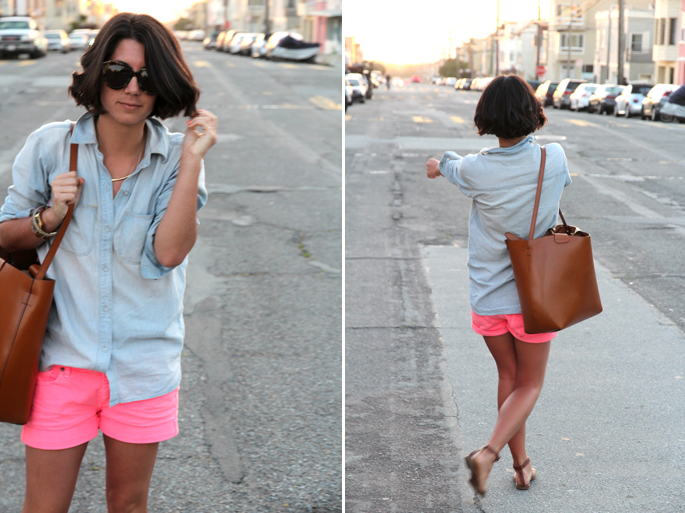 Chambray shorts + neon pink shorts are great. Thanks for sharing! Sounds like you're having a great weekend too. My weekend has been relaxing yet fun, and I've definitely been making the most of it. I love the hair cut and the super bright pink shorts! Your shorts are total eye candy! amazing tanned body and lovely hair !!! It's been so warm this weekend, I actually got a sunburn :/ loving this whole outfit! Love the paige shorts, they're fantastic! you GO girl! loving the neon shorts! Your hair looks fabulous, so chic! Super cute outfit! I love your bag and sandals. I was thinking your legs look SUPER dark then I read you had too much sun! lol!!! Love the pink shorts and LOVE that hair! Do you love it? I have that shirt and seriously wear it most out of my whole closet! Love it! Now I just need some hot pink shorts :) Love your hair! Looks fantastic! beautiful girl and beautiful style! Krystal your hair is so short!! I loveeee it. I'll live through you when it comes to having short hair. I'm too scared to cut my own! haha, hope to see ya next week at Lucky FABB!! I love your glasses and shirt! You look gorgeous! I love this outfit! Those shorts are adorable. I may have just fallen in love with a bag. Yup. I just looked again. The way that you've paired this incredibly simple and streamlined leather with the bright pink shorts is phenomenal. I always think that such vibrant spring trends need something to bring them back to earth - and this bag completely does the trick. I've also been looking for a denim shirt, and it seems like I've found one! It looks great on you, and ties together the femininity of the shorts and the earthiness of the bag - really well thought out ensemble. But fun too! Girl you are so tAn those shorts look aaammmaaazzzzing! Love the hair! Love your shorts and your blog!!!! 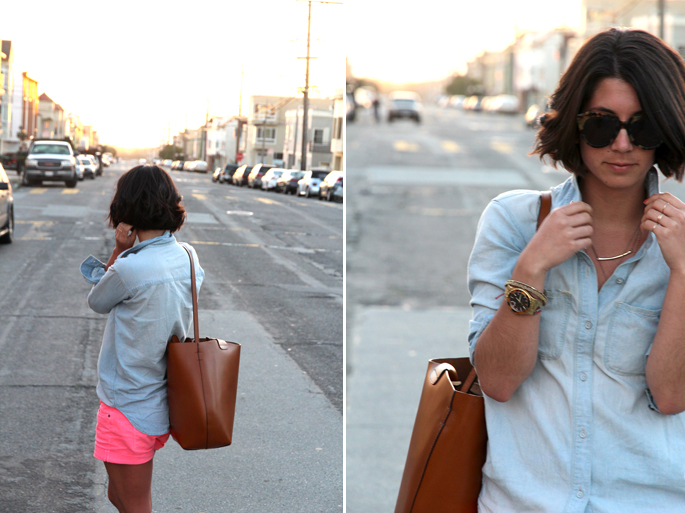 The bright shorts are a cool addition to the classic chambray shirt. This is what I hope will be my summer "uniform" once it gets above 50 degrees! Though I will definitely not be as tan as you are ;) Love the haircut, too. fine look, bag don`t understand as mine or not?